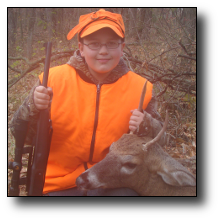 I had a great time camping out and hunting with my youngest son Seth this weekend. We set up his little tent Friday night and played cards and ate crackers, cheese, and sausage until it was bed time. We still sat up awhile and talked while listening to the coyotes and owls, because we were both too excited to sleep. 5AM came early. We got up, got dressed, ate a quick breakfast, and headed to the stand. At first light a doe and fawn came close to us but Seth decided to pass and wait for one of the bucks we knew were in the area. The doe and fawn saw us but couldn't quite figure us out as they were up wind from us. They blew at us and would take off for a few jumps, then I would tip a can call and they would come back and blow again. This happened several times before they left for good. We waited, and patiently scanned the woods for movement. About an hour later I looked to my left and saw a small buck come out of a ditch and head our way. He was only 50 yards away, or so, and by the time Seth got situated he was within 30 yards, and started to turn a different direction. I quickly mouth “bleated” and stopped him quartering away for the shot. At the report of the rifle he made a short semi-circle and collapsed. The bullet clipped the liver and went through the right lung. No tracking job this time. After high 5's and a short wait we went up to the buck. So, it's not the biggest buck in the woods, but I'm so proud of him. 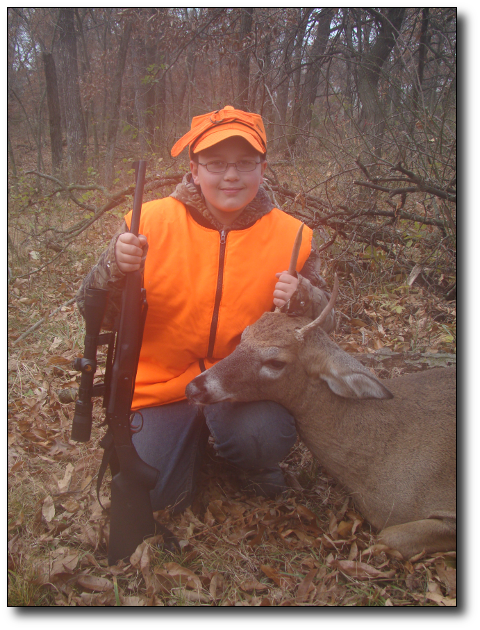 This is his 5th Missouri Youth Hunt and he has been lucky enough to fill his tags all of the five years. I know a large part of his success comes from the opportunities available through HSP. Thanks for all your hard work and dedication.